My name is Matt Winick from Ann Arbor, Michigan and I have a strong interest in learning history, social justice, and diversity. In these subjects or core values, I like to learn the importance of making Civil Rights stronger to reduce discrimination, have education reform to make learning a better tool, have diversity to accept people from different background, and many others. 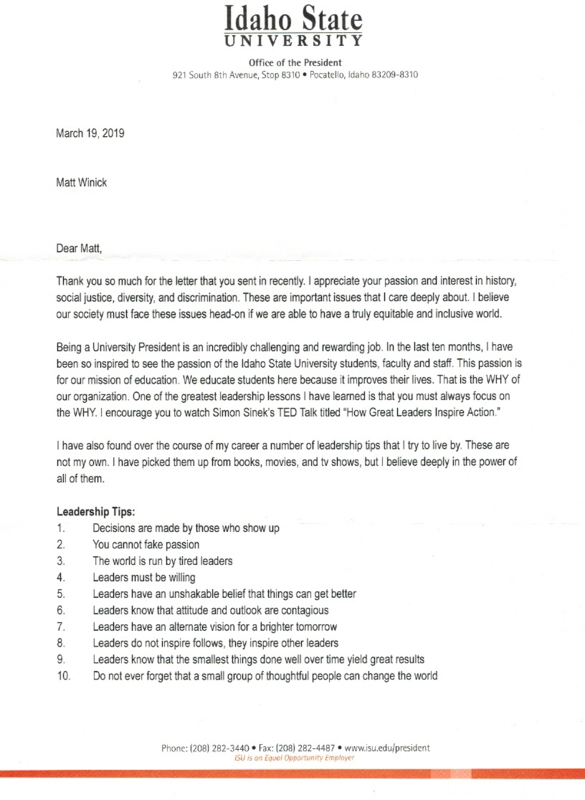 President Satterlee, the main reason I’m writing you a letter explaining how I find your work as 13th President of Idaho State University to be very inspiring to me. 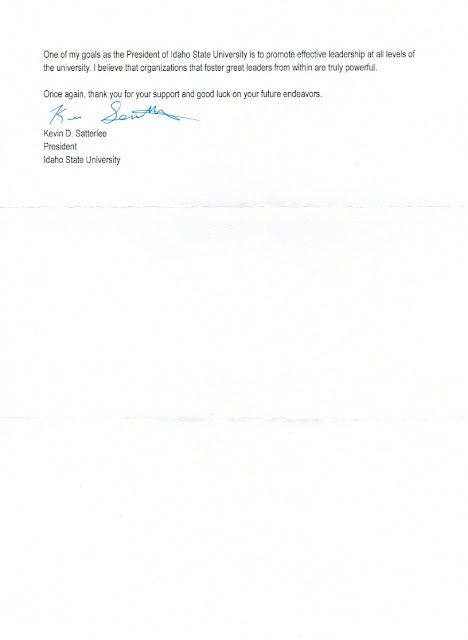 In your current role as 13th President of Idaho State University, I truly appreciate your commitment to be a strong supporter of Civil Rights by advocating for people with disabilities’ rights and working to push for Idaho State University to reduce discrimination to help protect minorities, women, and people with disabilities. Expanding tutoring services to help prove students help on their assignments from tutors, pushing for more accommodations to help students with disabilities to help assist them on learning like extra time on exams or use educational software including recorder to help improve their comprehension, and implementing more liberal arts with basic classes (history, humanities, arts, science, and introduction) to help make education diverse is common sense. I like your approach on improving diversity by hiring women, minorities, and people with disabilities to work for the college, expanding recruitment to help encourage women, minorities, and people with disabilities to get an education, and partnering with different diversity groups on Idaho State University to find ways to help promote events to help educate people about different culture. On reforming Idaho State University I liked on how you launched “One Thing Campaign” to have staff of Idaho State University or students give feedback to the Office of the President to find ways to improve the college and pushed for a program to help address the need to reduce bullying. Another thing that I like about your work as President of University is how you work with different companies to find ways for students or grad students who have a focus degree to work for them, expand more funds for research programs to help students including the university to learn about how a topic or a subjects could make a great difference or be beneficial for society, and trying to find solutions to reduce high tuition cost to help student who can’t afford or are low income get access to an education. 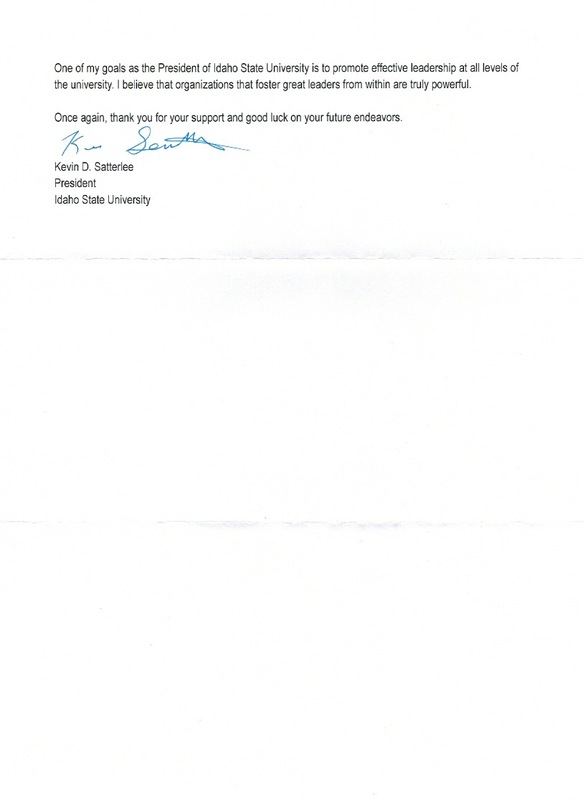 Besides your work as President of Idaho State University, I like on how you are a heavily advocate for Civil Rights including people with disabilities’ rights, expressing the need to reduce bullying, supporting environmental protection causes, and continuing push for common sense education reform. President Sutterlee, I have autism with a learning disability. Having a disability is hard for me because I have trouble on comprehending on learning different advance subjects, sometimes I struggle to communicate my thoughts, and get teased. Your commitment to be a strong supporter and advocate of Civil Rights including people with disabilities’ rights and the need to reduce bullying really inspires me to work hard on my disability. Also on Youtube I enjoy listening to your lectures about the need for education reform and how the core values (Trust, Compassion, Stability, and Hope) can help make society, education, and the job productivity a better place for people including people from different background. Your current role as President of Idaho State University gives me motivation to continue to learn history, social justice, and diversity. My future goal is to someday work in these areas to help emphasize the need to make Civil Rights stronger to reduce discrimination, have diversity to accept people who are different, need for education reform to help make learning a better tool, and many others. I strongly believe that you are making a great difference for society and education. I’m very proud on how you are working hard to support Civil Rights, improve education reform, and many others. You have inspired me to work hard on my disability, learn more about your work and to continue to learn different subjects. Also your speeches on Youtube and your core values are very motivation to learn. I was wondering if you could please share with me what it is like being President of University of Idaho. Thanks for taking the time to read my letter, working hard to make a great difference for society including education, and inspiring me. I wish you the best to continue to make a great difference.